Since the introduction of cloud storage started by Dropbox, it is more convenient to backup or sync data across different devices. We now can save our photos or videos from the smartphone to cloud server automatically in case of damages. For Android users, Google drive seems the best options as it is shipped in default with 5 G free storage. Plus, you can create documents (docs, spreadsheets, presentation) immediately with Google apps, which can't be achieved with its competitors. According to an online survey, Google drive is the most popular app among Android users all over the globe. However, what is to do if Google drive is not working properly on your Android phone or tablet? This will cause a lot of troubles if you used the app extensively. In here, I will list all the possible solutions to help you fix this problem. Please follow the suggestions list below to let the app work again. Google Drive needs Internet connection to work as it is a cloud service. 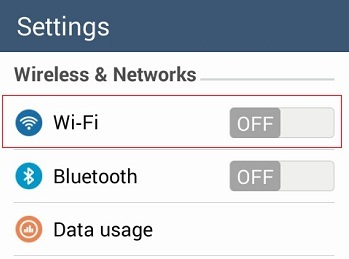 Therefore, check you have turned on Wi-Fi or mobile data on your Android device. If your Android phone is already connected to Internet but still unable to sync/ backup/file sharing, etc. then try to close and restart the app on your Android phone. Or simply reboot the phone if you don't know how to do it. If it still has the issue, you will need to uninstall the app or upgrade to the latest version, especially after you updated the Android OS. Then install the app again from Play Store. Plus, it is not recommended to install it from third party sources.